I do love coffee, I really do. I like mine hot and black with just a splash of two percent milk. that my husband got me for Christmas. I'm reading through the Bible this year with 365 days of truth by She Reads Truth. In the margins of my journaling Bible I doodle illustrations from that day's readings, make a note of verses that stand out to me, write down word meanings, lists, cross references and such. than to just read to get that day's passages checked off, without really absorbing what I'm reading. in a whole new way, a whole new level. I'm loving it, maybe even more than my morning coffee! Your photos are absolutely wonderful, Elizabeth! Beautiful POV ...beautiful subjects. I've seen other examples (on blogs) of journaling Bibles; what a creative and meaningful practice! Thanks so much, Evelyn. Journaling Bibles seem to be the catching on! I would never think of that. Very creative, Elizabeth. That's such a lovely way to read the Bible.,, it's a great way to really get one engaged. It has blessed me so much to read the Bible in this way. This is beautiful. I think you're like my boys. They always wanted to be drawing or creating while being read to. I would think they weren't listening, but then they would answer every comprehension question. Thank you, friend. Maybe your boys need journaling Bibles! beautiful.. loving the continuation of your bible journaling. may i know where you found that coffee cup? please.. I can't believe that someone as creative as you can't draw at least as good as me, which is grade school level at best. The cup is from Homegoods and/or TJMaxx. what a lovely way to spend the morning. It is, indeed a lovely way to spend the morning! You've captured the quiet beauty of a morning ritual beautifully. 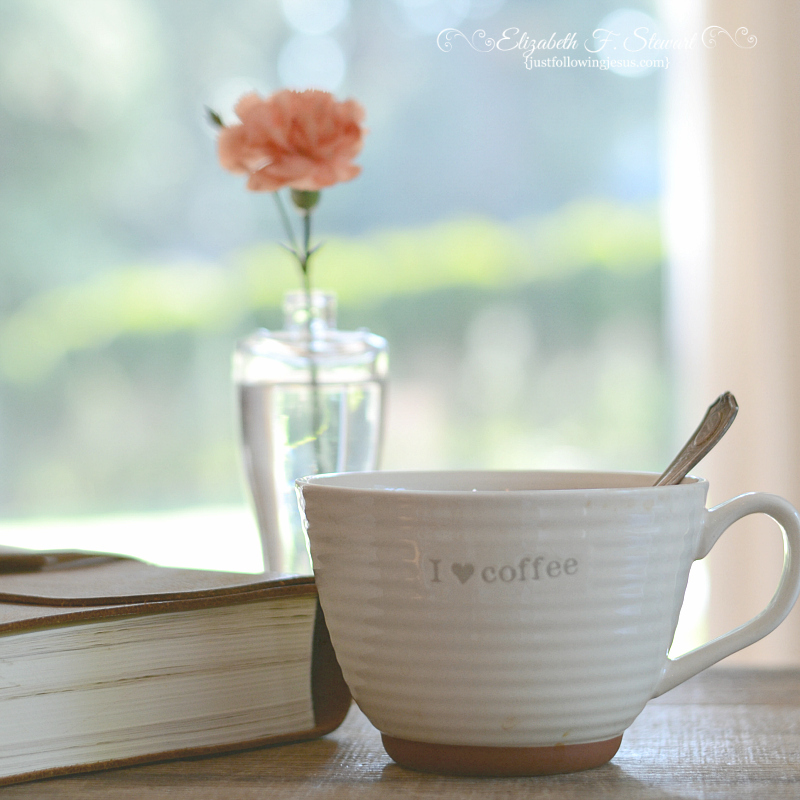 I like that mug and that bible journal does look beautiful. The mug is from Homegoods and/or TJMaxx and the journaling Bibles can be found on Amazon. I would LOVE for you to pull up a chair! 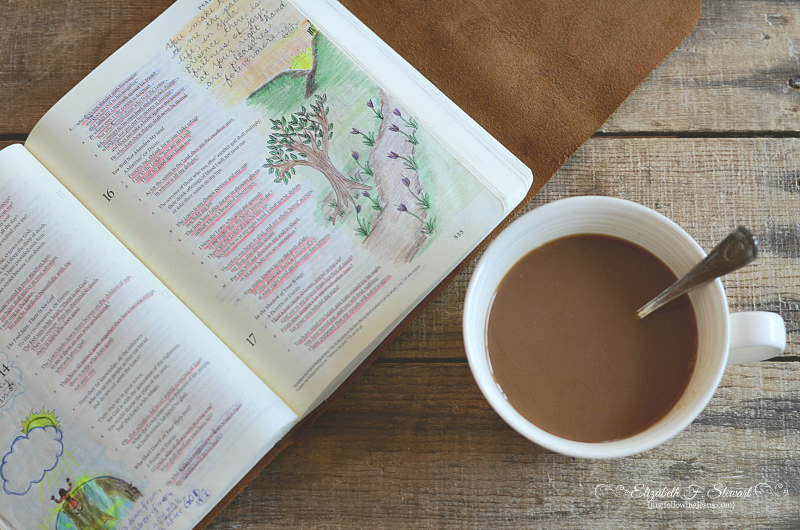 I bet you would love, and be great at, journaling in a journaling Bible. What type of pens do you use for the journaling Bible that don't bleed through the pages? Carolyn, I use Zebra F-301 pens and crayola colored pencils. I'm always so...moved by your gorgeous drawings (and photos!). Thanks so much for sharing, Elizabeth. And I didn't know there was a Bible made with drawing room! Thanks so much, Julie! The print is small in the journaling Bible, which is the only drawback. I love this post. And your drawings. As I can't even draw a proper stick figure, this method of Bible study wouldn't work for me. But I could fill the margins with words. And I'm with you on the coffee :). Sharon, I'm a doodler, not a real artist. I bet you can doodle! Wonderfully done. 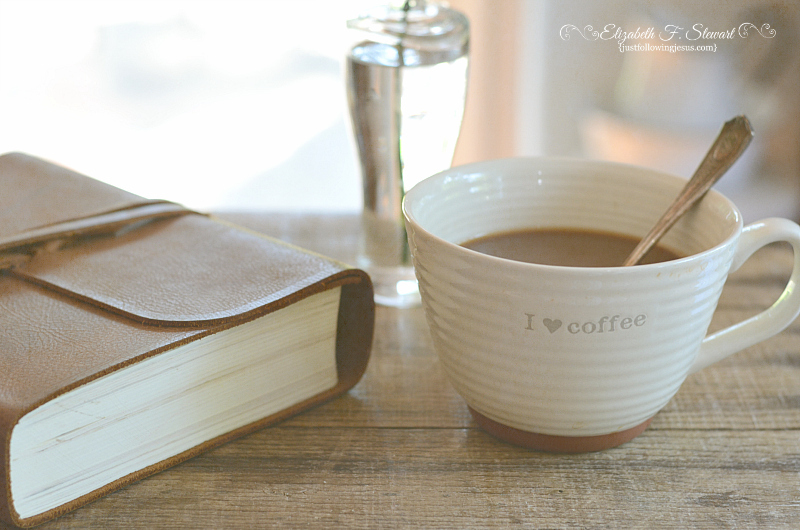 I love that the color of your bible cover is the same as the color of your coffee in the cup. I used to have my coffee the way you like yours, but recently my sister converted me to use heavy whipping cream in my coffee. For my taste buds, she was right . . . ummmmmm . . .good. Thanks so much Earl! Enjoy that coffee and cream! Lovely textures and a novel way to study the Bible! Beautiful! You are a talented doodler! I thought of getting a journaling Bible but I wanted to finish reading through my Amplified before I move to another version. I'm not terribly talented with pen and pencil but I imagine I would be writing words to music in the margins of mine quite often. You inspire me, dear friend. Oh, i'll admit I am terribly behind on this... I think due to the stress of reading and journaling. I like your idea of reading and then journaling the next day after I process. Ah you have totally just sparked my fire again. thanks for this post.